After a busy summer, many homeowners wonder how to steam clean carpeting to reduce dust or remove stains and odors before the holidays bring company and guests to their homes. While you could certainly hire a pro to clean your carpets, it’s not a difficult task to do yourself. You just need to know how to steam clean carpeting properly. Once you’ve correctly vacuumed and prepared your room, you’ll find the actual cleaning goes fast. Plus, the results are so impressive that it’s a very rewarding chore! The phrase “steam cleaning” distinguishes a water-based method of cleaning carpets from dry chemical compound methods used by some professional companies. It’s not the steam that cleans the carpet, though: it’s the detergents which the steam (or hot water) activates. That is true when you rent or buy a machine, or when you hire professional steam cleaners to do it for you. Even dry chemical cleaning companies use a small amount of water! Steam cleaning — or carpet shampooing — does not require professional equipment. It also does not have the toxic risks associated with dry chemical carpet cleaning. However, since water is involved, it does take longer before your carpets to dry. For most people, the wait is worth the worries saved. Carpet steamers (also known as carpet shampooers) aren’t vacuums. They’re specially designed to wash and at least partially dry carpets, extracting grime as they go. If you want them to get the ground-in dirt out of your carpet, you must vacuum thoroughly before steam cleaning. That doesn’t mean your usual quick back-and-forth over the rug, either. 1. Pick up all toys, books and other items on the floor. 2. Remove your furniture or, at the very least, pick up smaller pieces (floor lamps, ottomans, etc.) and take them to another room. 3. Dust your baseboards, so you’re not just knocking stuff off of them and back onto your freshly-vacuumed carpet. 4. Use your crevice attachment around the base of the walls and any remaining furniture. 7. Vacuum carpeting in two directions, first slowly in one direction then again from a 90-degree angle. Although this seems like overkill, carpet fibers are twisted, so vacuuming from different directions ensures each “side” of the thread gets cleaned. While the carpet cleaning machine will remove quite a bit of grime and dust, the heat involved can also make stains harder to remove. 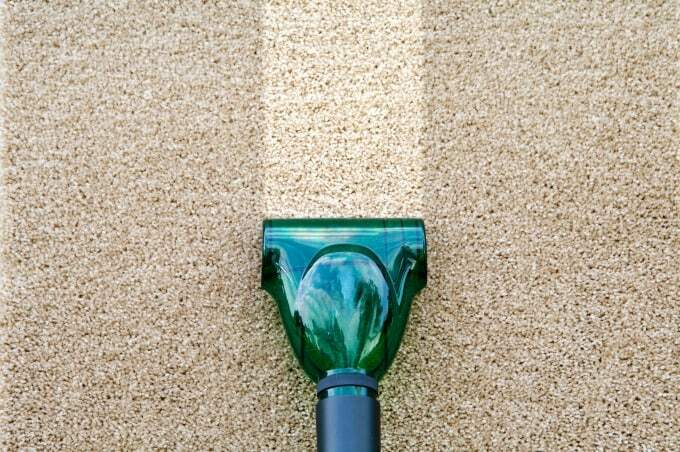 You’ve probably experienced this yourself, having cleaned your carpet only to find the stains returning a few days later. Why? Because the cleaning process forced the grime into the carpet pad, and then the carpet fibers wicked it out of the pad and back to the surface. Here’s how to remove carpet stains to keep them from coming back. It’s the same method I used to get dried paint, old pet messes, and even mystery stains out of carpeting in my home. If you can remove all of the furniture from the room, great. If not, you’ll want to cut squares of wax paper or aluminum foil and slide them beneath the edges or feet of furniture. This will protect your furniture and keep it from absorbing any moisture in the carpet left behind after steam cleaning. Leave them in place until the carpet is thoroughly dry, usually about a day. It’s always a good idea to spot-test any cleaning product you plan to use on your carpet. I recommend testing in a closet or other out-of-the-way location. This way you don’t risk damaging or fading your carpet with a product that’s not right for it. If you are concerned about your machine’s warranty then, by all means, use the manufacturer’s recommended products. But note that these products are highly perfumed, something that can irritate allergies and asthma. I’ve also found they don’t clean any better than using a homemade solution while costing much, much more. Step One: For the first step, I use one tablespoon of Dr. Bronner’s Castile Soap for every quart of almost (but not) boiling water while filling my machine’s tank. Castile soap is oil-based. Those darker places in high traffic areas on your carpet are also oil-based, usually from city grime from the bottom of your shoes. Castile soap is ideal for tackling these areas because “like dissolves like,” which means Castile soap is excellent at powering through many carpet stains all on its own. Nevertheless, it is soap, so it needs to be rinsed out of the carpet to finish the cleaning. That’s where the second step comes in. Step Two: On the second go-through, use a 50-50 mix of white vinegar and very hot water. In addition to neutralizing and removing the soap, vinegar has stain-fighting properties. 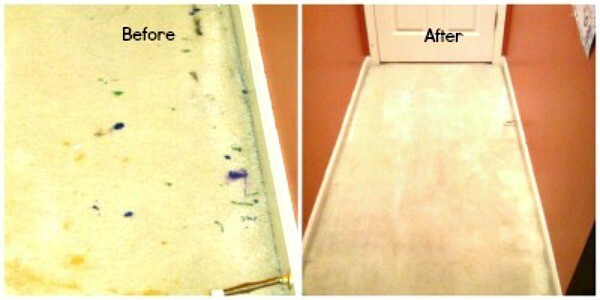 This second pass-through will lift away more dirt and grime while also deodorizing your carpet. It is not necessary to follow it with a clean water rinse. Most carpet steam cleaners are designed to lay down water when you’re pushing the machine forward then extract it while you pull it back. Be sure to pull the cleaner VERY slowly so you can remove as much water as possible. Too much water left behind will cause your carpet padding to get soaked and can lead to mold, mildew, and horrible odors. For this reason, it’s also best to steam clean carpeting when the weather is warm enough to open the windows since that will speed up drying. If you can’t open the windows, then run fans to help your carpets dry before mildew can set in. How Often To Steam Clean Carpet? At a minimum, you need to steam clean your carpeting twice a year. Late Spring and Autumn are good times since the weather is typically warm enough that you can open windows to speed the drying process. If you have pets or suffer from allergies, then you’ll want to steam clean your carpet every season to keep your carpets looking their best and reduce dust in your home. I have a hoover and Ive looked everywhere for this answer and cant find it. How many times do you clean your carpet? Ive done mine 6 times in a row making sure I maximize water extractions and let the carpet dry a little between passes. The water in my bucket while its not as dark as it once was is far from tap water clean looking. How do I know if Ive given it enough cleanings? It just depends on how dirty it is, T-Bone. I’m always concerned about soaking the pad and causing mildew, so I usually do one cleaning working the length of the room then another working the width. If it’s still looking dirty a week later I’ll do it again — especially the high-traffic areas. But that way I feel a bit more confident that the pad didn’t get soaked through. Thanks for sharing this advice on keeping carpets clean! The last thing I want is a house that has a ton of stains from ineffective cleaning. Do you happen to have any advice when it comes to hiring a carpet cleaner? It would be nice if I had someone do the cleaning for me so that I don’t have to take too much time out of my day to do it myself. My first suggestion would be not to hire blog comment-spamming carpet cleaning companies or janitorial services like the one you work for. If you aren’t smart enough to realize that this is a “no_follow” blog, and that I delete URLs to commercial sites, you certainly aren’t smart enough to be dealing with carpet stains. And that’s saying a lot. Just found your site and LOVE it! This response makes me believe that we would be great friends. No BS, straight to the point, i.e., you are an IDIOT and I can’t be bothered to waste my time with you ! LOLOLOL LOVE IT! I have a question. Do you use a regular carpet machine or does yours heat the water? I’m thinking of just getting a regular machine and putting hot water into it. It sounds like what you did, correct? My old machine heated the water, but I have to heat the water for the one I use these days. Can I use my Bissell steam cleaner to clean rugs on top of engineered hard wood floors? Love the tip about putting down foil so you don’t have to move big pieces of furniture. Thanks bunches! I really wouldn’t recommend it. Engineered wood is sensitive to moisture, and I’d worry that the Bissel wouldn’t dry the rug enough to prevent warping the floor. Maybe move the rug to a patio to steam clean? machine, but an earlier post, it’s a Hoover SteamVac Carpet Cleaner with Clean Surge, F5914900. I am planning to purchase a steam vac, but now I’m confused on which one? I’ve never tried using that one, Lisa, so I don’t really know how it works. Sorry! I have a bissel machine where the water and detergent containers are separate, no mixing needed. When you say you use 1 tbls. of Dr. Bonner’s soap for every quart of water, are you mixing them? I’m assuming I would simply fill my detergent container full with either the soap or the vinegar and allow the machine to mix them, as per the operating instructions? Yes, my machine has one dispenser that hot water and soap go into. You should always follow your machine’s instructions. DO you think it is ok to FILL cleaner part with the Dr Bronners soap?? Won’t get carpet too soapy?? I also have a Bissell. Did you even bother to read the article before leaving a comment? I’m pretty clear that you aren’t to FILL the cleaner with Dr. Bronners. You add a small amount along with water, and then you follow with a second cleaning using water and vinegar to get rid of any soap residue. 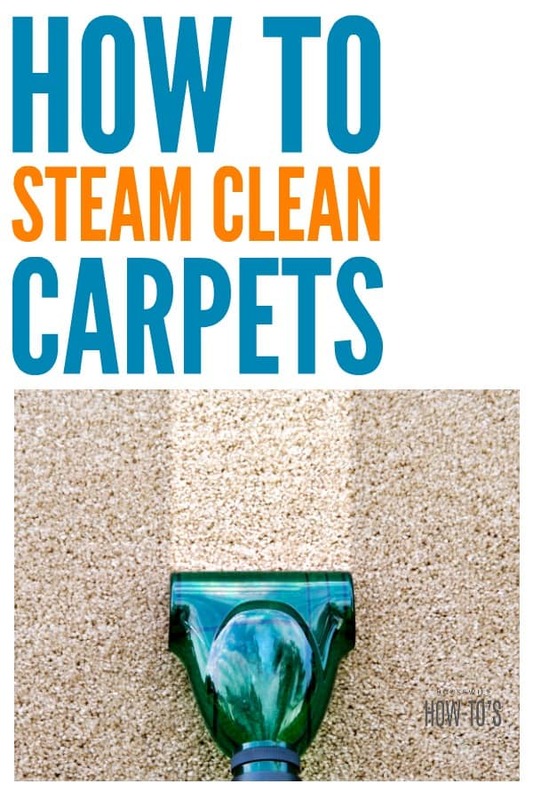 Ummmm… in spite of the four headings that talk about steam cleaning carpeting, this article isn’t about “How To Steam Clean Carpeting”. It’s about how to use a carpet cleaning machine to clean carpet, not a *steam* producing machine. It wouldn’t matter, but you have to read an awful lot of text until you get to the bit that says, “it’s important to realize that most carpet steam cleaners are designed to lay down water when you’re pushing the machine forward, and extract it while you pull it back toward you”. Camille, it’s so nice to meet a new reader! I don’t think I’ve ever seen an unscented Dr. Bronner soap in the store, either. I’ve used both the peppermint and the lavender and have never had a problem (aside from a sudden craving for candy canes in the middle of August once). My condolences on your housekeeper’s retirement. You must feel so lost trying to remember it all! If there’s anything I can do to help you get back in the swing of doing it yourself (besides cleaning for you HAHAHA), let me know. Tropical Traditions makes a great unscented castile without added fats The only ingredient is saponified coconut oil.